If you were one of the half million or so Jewish Americans who received "Let My People Go: The Struggle Of The American Jew To Come Home To Israel" in the mail the first thing you probably would have noticed would have been the cover of the book, which features a somewhat crude drawing of a man in a business suit, with a briefcase, straining against numerous ropes tying him to a signpost which reads "Wall Street". There are so many of these ropes that it's quite obvious the man will never be able to break them simply by straining. 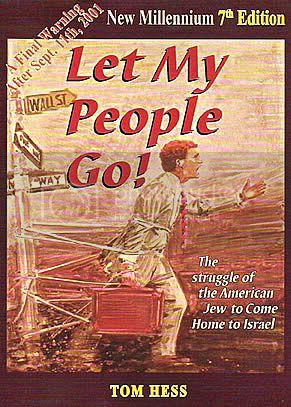 If you had bothered to read the book, rather than simply tossing it in the trash, you'd have found no ambiguity ; the book says the the man on the cover is supposed to be Jewish, and it's hard to escape the implication that "Let My People Go" begins, and quite noisily so, with the premise that Jews, as a people, are bound to materialism, selfish and greedy. The book was in English, not German, but otherwise recipients might have wondered if they were staring at a piece of 1930's era anti-Jewish propaganda, commissioned by the Third Reich, that had become somehow displaced in time, thrust into our era by a freak temporal anomaly, a wormhole or sinister wrinkle in time, because the picture on the front cover of "Let My People Go..." suggests that Jews, perhaps more so than any other ethnic group, are bound, against all their best efforts or intentions, to money. The book goes on to ask why the greatest concentration of Jews in any urban area on Earth can be found in New York City, which Tom Hess claims may be the World center of "hedonism and perversion". He even seems to invoke the myth of Jewish ritual sacrifice. By Tom Hess's own reporting, in 2004 his ministry, the Jerusalem House Of Prayer, sent "Let My People Go! - The Struggle Of The American Jew To Return To Israel" to about 550,000 Jewish-Americans and, per Hess's account, perhaps 800,000 copies of the book - urging Jews everywhere around the globe to return to Israel before they are annihilated in a rising wave of anti-Jewish hatred Hess predicts - have gone put since the book was first published in 1987. Did the myth of the "greedy, materialistic Jew" die with the Third Reich ? Of course not. The cultural trope is alive and well, thanks in part to Christian Zionism. Neo-Nazi groups could never get away with sending hundreds of thousands of pieces of anti-Jewish literature through the US mail. Christian Zionists can apparently do so with impunity, and cost of mailing their literature - if sent out by registered 501c(3) nonprofit organizations - can be federally subsidized. Whether by accident or by intent, "Let My People Go!..." is packed with many of the most vicious and pervasive anti-Jewish slurs to ever have been coined. "There is so much blood on American soil it is a miracle that we have not already been destroyed as a nation! Many secular, reform, and conservative Jews have encouraged abortion despite the fact that the killing of their future generations will affect [sic] the future of the Jewish people. There is little difference between child sacrifice in the Old Testament and abortions today." "There is little difference... " - the tone of that assertion fits quite readily with the pseudo-sociological narrative that accompanied the soundtrack of one the most notorious pieces of propaganda ever filmed, The Eternal Jew. In his discussion of abortion, Hess does not mention Gentiles who, by most accounts, are reported to also engage in the practice of abortion. By likening Jewish abortion to "child sacrifice in the Old Testament" Tom Hess evokes the obvious - those Jewish women so heartless as to have their own children, the future Jewish generation, ripped from their wombs... and to whom do they sacrifice those children ? Moloch ? Satan ? From the myth of Jewish ritual child sacrifice, it is only a short hop to the legend that Jews have vestigial horns atop their heads. The idea that Jews embody singular, singularly repugnant traits becomes increasingly distinct as one reads the book. On page 53, we learn that York York City may incarnate the most extreme sins of our age, and on page 55 readers encounter the terrible truth that NYC has the greatest concentration of Jews on Earth !. What are reasonable readers to conclude ? "The two characteristics that most exemplify Babylon in Revelation are materialism and hedonism. New York City is not only the leading city in the world regarding money and materialism (with the World Money Market centered there) but also may be the leading city in the world regarding perversion and hedonism. "Why are there more Jews in New York City than in any city in the world and more Jews in American than any nation in the world?" There are more Jews in New York City than anywhere in America because New York City was long the central immigration route into the United States. There are more Jews in America because The United States had, for a time, liberal immigration policies that allowed Jews-- who were fleeing the terrible Russian and Eastern European pogroms of the late 19th and early 20th Centuries --to become American citizens. If they are "American" Jews - why 'go home to Israel?' Granted "Norwegian-American" doesn't have the same religious overtones. To imply "American" Jews are Jews first, Americans second. Or even not really fully American. Using the word "home" as in "going home to Israel" certainly does imply that a Jew's "home" is nowhere else. Semantics as these are an echo of the Nazi state's use of "Non-Aryan Christians," also implying that certain races may be Christian, but they are non-Aryans first: a dangerous ethic which is also theologically reprehensible. Can a Jew be at "home" in America? I should certainly hope so. I'm trying to wrap my head around them all. I've come to see Kittel as very important in this - how can someone who might have been even called a philo-semite flip so radically and turn towards such extreme hatred ? I now see the answer in theological terms. Susannah Heschel put her finger on it ; racism is at base a theological argument. A few weeks ago we got a "free" book that turned out to be very anti Roman Catholic. These people are going out of their way to offend people. When I tried to report the book, I was told that unless there were calls for violence in it, it was protected by free speech. Somebody spent a considerable amount of money on this. Even though such speech is constitutionally protected I'd think that , based on the ADL's mission statement, the organization should be concerned with Hess's book. This post on mailing of 500,000 anti-Semitic Books to Jewish Americans proved to be a really good one. Actually this a very good and non-violent idea. Hats off for this great idea. Thank you so much for sharing the post! This is really a sad thing that the people are not able to go their home Israel. Being a good reader I always follow cheap college essay writing service for more articles. Reading this story made my eyes wet.